aims to build helpful frameworks for understanding the cultures and worldviews of others and to engage with and apply these understandings to interactions in cross-cultural contexts. These understandings inform further studies in other aspects of language development work and facilitate respectful attitudes and relationship development in cross-cultural settings. analyses and identifies components of languages at an initial level to help those involved in language learning and in preliminary grammatical analysis. explores a range of language learning strategies and techniques that may be useful in learning to speak another language regardless of whether or not the language is well documented. introduces articulatory phonetics and gives practice in distinguishing, producing and writing sounds in other languages using the International Phonetic Alphabet. You can study the four subjects in this course as a non-accredited short course and we will issue you with an SILA certificate. 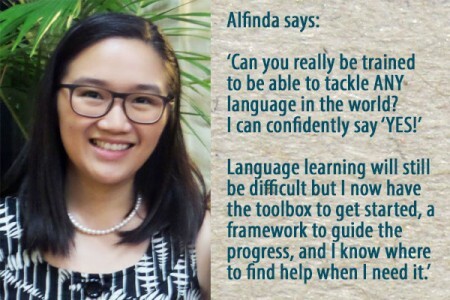 Alternatively, Language Awareness, Language Learning and Phonetics can be taken as the unit Linguistics and Language Learning, accredited through the Australian College of Theology (ACT) at graduate and undergraduate level through our partner Melbourne School of Theology (MST). An official transcript can be obtained from the ACT if you are enrolled in their courses. If you are currently enrolled in an ACT award you may be able to credit this unit to that award. Please contact us for more information on these options. Part time/single subject students please contact us for costs. For more information about fees, please click here. Self-catered onsite accommodation is available during Launch. For more information see the Accommodation page. Please see course dates for scheduling of the next Launch course. A children’s program is available during this course. Please contact us for details.